What to Expect at Your Steering and Suspension Service If you need steering and suspension services, our expert, ASE-certified technicians at Ace Auto will give you a complete system evaluation. We thoroughly inspect your vehicle’s shocks, struts, and springs for any signs of wear or damage. 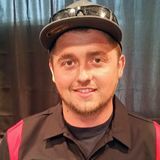 Our technicians will look at any steering or suspension parts that are not performing as intended and let you know if they are worn, damaged, or missing and need to be replaced. Our master mechanics will let you know if there are any other suspension repairs needed to get you back on the road safely. Replacing your parts may change your car’s existing wheel angles, so we’ll also check your wheel alignment. 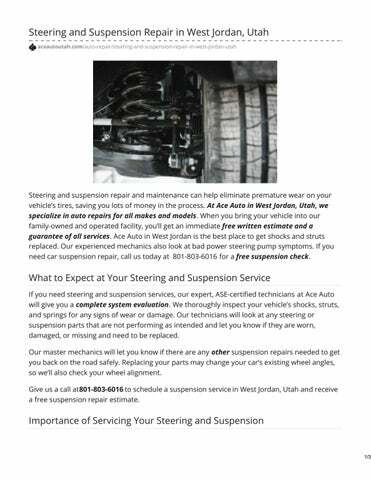 Give us a call at801-803-6016 to schedule a suspension service in West Jordan, Utah and receive a free suspension repair estimate. A vehicle's steering and suspension is the part of the car that helps provide optimal ride comfort and handling. Normal road conditions can cause your shocks, struts, and springs to wear out, and that wear and tear can affect your vehicle’s stability and your control when you drive. It may also accelerate the wear to your tires—again costing you more money down the road. Many manufacturers suggest having your steering and suspension system checked every 50,000 miles, but if you notice any warning signs sooner than this, make sure to bring your vehicle in and our suspension mechanics will take a look. Signs of Common Steering and Suspension Issues Warning signs include: Hearing a lot of noise when you drive over bumps Your vehicle provides you with a shaky ride You feel your auto bouncing and wandering as you drive Your steering wheel is crooked or hard to turn Your tires seem to be wearing unevenly You notice fluid leaking from your seals Your steering and suspension system should not be out of control. If your car suddenly feels hard to drive, it’s time to have your suspension looked at. Having your system checked regularly, as recommended at 50,000 miles, can help you avoid unnecessary auto repairs and costs, and keep you safer on the road. But remember, if you notice problems earlier than 50,000 miles, it is better to be safe than sorry. Maintaining your steering and suspension will also keep you more comfortable on the road.